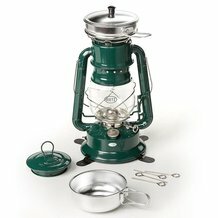 Our Dietz Oil Lantern Cooker - Green is OUT OF STOCK, but we have ordered more! You are still able to purchase it now and we will ship it to you as soon as it arrives. Questions? Please call 1-800-438-5346 or email us at info@Lehmans.com. Double-duty for campsite or emergencies! This lantern is similar to a windproof and durable Dietz #30. Remove the top, add the special grill and use the aluminum plate or 12 oz cup to heat water, soup or a small meal. Easy to store, so you'll always be prepared. Anchor the lamp to the ground with the snap-on bottom bracket and holding pegs so lantern/stove won't tip over. Great for patio cooking, camping or emergencies. Green lantern with chrome trim. 12"H, plate and cup 4-1/2"OD, 2 lb. Lantern uses Dietz Little Wizard parts. Great looking lantern cooker on line. I bought this as a back-up to my butane stove and it works to warm up 1/2 a cup of soup. However, I would never use this inside a structure or unattended. It's Chinese workmanship shows, for example, the globe is crooked on the burner, you can't twist on the cooktop straight, and the little cup that fits on the cooktop? It leaks from the rivet that holds on the handle if you fill it over 1/2 way. It is also the only lantern I have that really smells when its lit. If you need a lantern, pay the money and buy Lehman's Feuerhand, if you want to warm up a little soup outside, this works. Lehman's says: Thanks for the feedback! It sounds as though you might have received a defective item. Please reach out to our customer service department so we can make it right! We look forward to hearing from you! 1-800-438-5346. I was a little nervous ordering this because my Post Office is not gentle with packages and I was afraid it would arrive broken. No problems, it was well packed and arrived okay. This is a nice kerosene lantern of a decent size. It is actually a little bigger than I expected, a good thing. I haven't tried cooking on it yet, but I don't see any problem doing that. This is the best quality lantern I own except maybe for the 100 plus year old ones I inherited. I'm pondering buying more while they are on sale, both for me and as gifts. People leaving bad reviews, do you understand what it's really mean for? I would recommend warming tea or such, but this would work best if you needed to melt snow to survive. I thought it was a fantastic idea! But the quality is just not there. I received both a green and black one and on each of them the metal on top was bent-- To the point where it's difficult to put the metal bracket on and take it off without feeling like you're going to break it. The rest of the lantern is great but I wish that the quality was better. Two comments-- No where on the box nor the directions does it tell you the type fuel required. Is kerosene ok? Second, it is made in China. I didn't know that Dietz was a Chinese name. Lehman's says: Sorry for the confusion! Yes, Dietz lanterns burn kerosene. The lanterns were invented and originated by the Dietz family in New York in 1845. Forced to close their USA factory in 1970, Dietz lanterns remain the highest quality lanterns available from China. I tested this Lantern out. It worked well, and for boiling water it took some time. I was in the barn and the air temp. was 25 F. and the Lantern was set on high (just UNDER smoking). 8 oz. of water in the large pan with cover on. Temp. was taken with an air conditioning setup thermometer. Start Time Water Temp 2:30 pm 40 F 2:40 pm 95 F 2:50 pm 160 F 3:00 pm 195 F 3:10 pm 210 F 3:20 pm Light Rolling Boil It did work so if it worked for water it will work for other things. It also keeps my hands warm. Thank You. I love this Lantern! I've had mine for a few years now, and when they went on sale this year I knew that's what everyone was getting for Christmas! Great for heating soup, I've even cooked eggs in it! This my 2nd Dietz lantern, 1st with the cooker. Works well, I wouldn't count on it as an efficient way to boil water, but it heats stuff up nicely. Overall a good item to have for camping and/or emergency use. I just received this lantern and tried it out inside my kitchen. I put about 6oz tap water into the larger cup with the lid on. It was 175 degrees in 18min and boiling in slightly less than 30min. I had the flame turned down as recommended. No soot on the bottom of the pan. The lantern seems to be very sturdy and the stabilizer would probably come in handy outside. A stainless steal version would be nice though I'm not crazy about using aluminum. Bad weld contruction. Top section is crooked welded more than half an inch. Globe nearly breaks when lifted. Top fits very poorly. Was disappointed that one of the little pans had a popped rivet and the handle came off. Other wise, worked great. I found that I needed to keep the lid on if I wanted to bring water to a full boil. Just went through 5 days of no power, and had hot water for tea and washing, poached eggs, and even popped single servings of corn on top of the lantern. I had a small 2 1/2 cup stainless steel pan that fit perfectly on top. I agree that the lantern puts out good light, but it doesn't heat well enough to boil water and that is inside with the power on. Turning it up higher only produces more smoke. It is better than nothing, that's for sure. I love it! My friend gifted it for Christmas and it is fantastic. Light, heat and a mini-stove all in one. For outdoor applications the anchor kit is a great idea saving upsets and blowovers while fixing the early morning coffee. The Dietz Oil Lantern Cooker has been one of my most used items in my home. It quickly heats up many meals, hot water for beverages, provides light and atmosphere with very little footprint . My apartment is in an old building that has many outages and I am never without the basics ... just one of my many very wise investments an amazing important item/ tool many parts of..... whenever. I will be purchasing at least 3 more for gifts and for as well myself. Really like this product. Haven't used it yet but it will be quite study and good for emergencies. When I received Lantern, tried it to boil water, when temp. reached 196 deg. F. I turned it off. It will heat meals, camped for over 60 years, lantern is great. Very satisfactory as a lantern, but as a cooker, don't expect much. It will bring a room temp 6 ounce portion of canned soup up to a warm, but not really hot, temperature. Better than drinking it cold. I couldn't bring anything to a boil no matter how long I waited. After experimenting I discovered the lantern does not put out enough heat to warm a cup of water after 15 minutes. I purchased this lantern and have been satisfied with the light it generates however, the quality of the cup, grill and base are very low. This kit is only worth the cost of the lantern about ($14). Just what we needed for when the POWER goes out in the next ICE STORM !!! Last ICE STORM people were out of power for up to two weeks in our area .....I'm going to order more to give as gifts to relatives !